Explore how new coatings support the latest initiatives in acute-care facilities by incorporating chemical-resistant, formaldehyde-reducing, and anti-microbial technology. Describe how a coating can help reduce odors in long-term care facilities. Specify a high-performance coating that will best meet the specific needs of a healthcare facility. Explain cost implications of specifying an advanced-technology coating for acute-care or long-term care facility projects. There is a powerful new tool helping designers create better healthcare environments and it will probably surprise a few people. Traditionally considered solely in terms of color and finish, and the feelings it invokes in occupants in the space, commercial paint has been technologically advanced to now deliver much more to a healthcare environment than a sense of calm. These advanced architectural-grade coatings improve the indoor environment of acute-care and long-term care facilities by reducing respiratory irritants from the air and reducing the growth of mold and mildew on the paint film. They also support new cleaning and sanitation protocols by standing up to harsh disinfectants and more rigorous scrubbing regimens. Additionally, they help to reduce odors from the environment to maintain a facility that smells fresher. When the cumulative benefits are examined, these high-performing coatings now generate real value for facility owners and give designers the option to specify a wall paint that is simply visually stimulating, or a high-performance wall coating that is visually stimulating and actively helps to improve indoor air quality. Whatever the project, paint is the new partner in supporting a better healthcare environment. 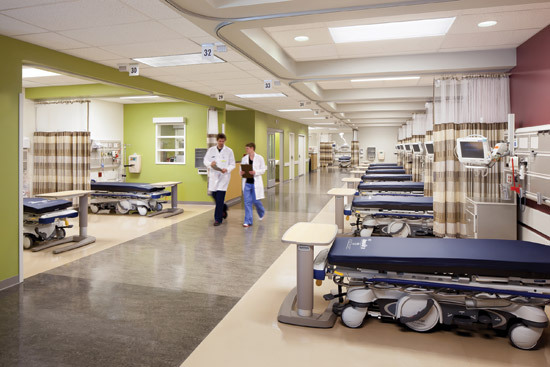 Advanced architectural-grade coatings improve the indoor environment of healthcare facilities in powerful ways. If the human cost was not a sufficient impetus for change, hospitals are also facing stiff financial penalties for HAIs that occur within their facility. Recently, Medicare, Medicaid, and other private insurance carriers have announced that they will no longer reimburse for costs associated with treating HAIs, resting the blame and financial burden entirely on the healthcare facility. These prevalent, and now pricey, HAIs have forced healthcare facilities to overhaul their cleaning and disinfecting procedures in an attempt to prevent or reduce these devastating hospital-borne infections from occurring. New protocols focus on employing more potent cleaning solutions, more frequently, with more elbow grease, more thoroughly throughout the hospital. The new, more exhaustive list of target areas includes spots that previously may not have been considered areas of high concern. Two areas that now require rigorous cleaning: the walls and the doors in patient rooms, surgical suites, common areas, etc. These surfaces can serve as reservoirs for microorganisms and pathogens that could cause infections in patients and staff. As a result, hospitals are using new and harsher disinfectant products and more abrasive cleaning techniques on these coated surfaces to destroy the unseen pathogens where they like to hide.